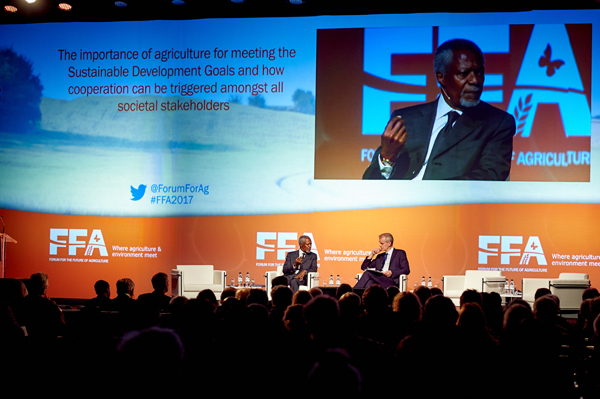 Former UN Secretary General Kofi Annan, in his opening keynote address, paid a special tribute to the Forum for the Future of Agriculture. “In just a decade, this forum has become one of the premiere venues to debate vital issues of agriculture, food security and the environment,” he said before setting out the five priority areas where he believes action should be urgently taken. At the outset, he called for more investment, especially in developing countries where the need and potential for increasing agricultural productivity and production are greatest. As he explained, history has shown that the former is a critical driver of economic transformation and social development. Secondly, Mr Annan emphasised the important role of smallholder farmers. They produce almost 70% of all food consumed worldwide. He urged governments and the private sector to help them by forming innovative and supportive partnerships. It is a role his Kofi Annan Foundation in Africa is playing as it works with leaders in various sectors to try to turn smallholders into agro-entrepreneurs and subsistence farms into profitable businesses. The former UN Secretary General then identified the need for food systems able to produce more food, but with fewer resources. This will require governments to adopt, enforce and strengthen policies that promote responsible natural resource management and prevent the loss of natural habitats, forests and biodiversity. 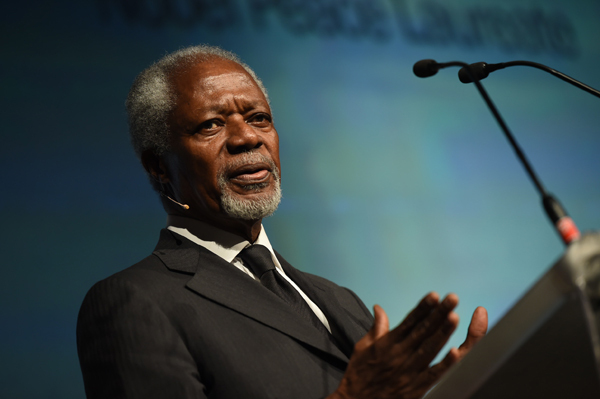 Finally, Mr Annan called for an immediate push “for climate-smart agriculture and food systems”. Efforts to reduce farming’s climate footprint and move towards renewable energy would help to avert climate catastrophe and create new opportunities for investment, growth and employment. He acknowledged that the agenda is ambitious, but it is not starting from scratch. The Sustainable Development Goals provide “a compelling vision with ambitious goals”. To achieve them, every government must play a critical role, as must all sectors in society and the business community. Later, the former UN Secretary General emphasised that the Sustainable Development Goals are universal – as opposed to the Millennium Development Goals which were solely for developing countries. Achieving their targets is a global commitment. “We all need to change our mindset and realise that we have to work together. We should not leave it to others,” he said. Mr Annan was critical of President Donald Trump’s plans to go against the current climate change agenda and promote fossil fuels in the US. “He has set the wrong example, but I hope the rest of the world will not follow him,” he said. In contrast, he pointed to China where public pressure, he added, is forcing the government to tackle environmental pollution.